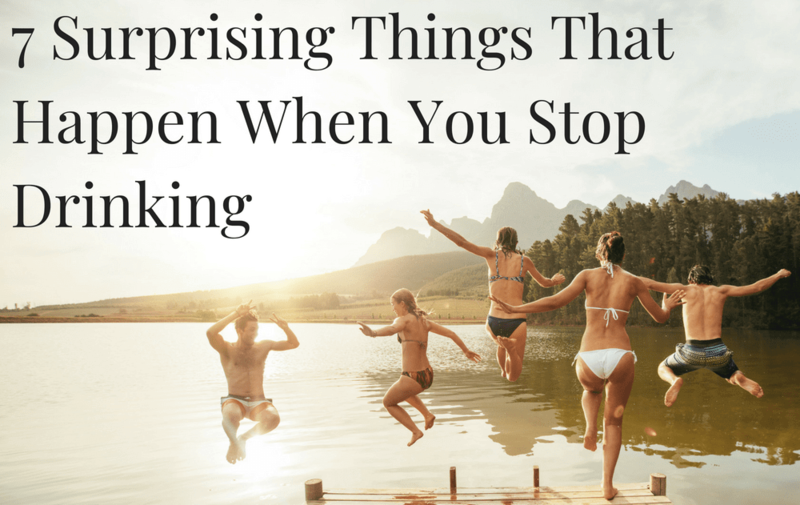 What happens when you stop drinking? I’d always imagined my life would remain pretty much the same as it always had been. I figured I’d still be the same person, doing the same things, living the same life… just minus the booze. Removing a mind-altering, time-sucking, hangover-inducing, anxiety-creating, mood-destroying drug from your life turns your world upside down… in a good way! There will come a time when you return home after a bad day and find yourself massively cheered up by a bubble bath and an early night. You – the person who used to need an entire bottle of wine to switch off – are happy with a cup of tea and a good book. Even though you sometimes worry that it sounds a bit sad and nerdy, you don’t really care because a) you’ve finally mastered the art of self care and b) you feel so awesome in the morning. When you’re trying to function through the fog of a hangover, just getting to work on time feels like an achievement. When you stop drinking, you acquire a new superpower: the ability to get stuff done. The problems that used to have you diving face first into a glass of wine just get dealt with, and you begin to wonder how on earth you ever managed before. Herbal tea? Infused water? 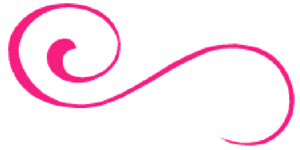 All that flowery, namby pamby stuff that you used to hate? Well, you will probably start drinking that. A lot of people find their sense of smell and taste improves in sobriety, so you can pick up subtler flavours. When meal times are about eating rather than drinking, you have a new appreciation for good food. A bottle of wine contains around 600 calories – that’s the equivalent of eating three doughnuts. When alcohol stops sabotaging your weight loss efforts, it’s a lot easier to lose a few pounds without having to be super strict with your diet. Plus, the fact that you’re not hungover all the time means you’re far more likely to do some exercise and actually stick to your workout goals. There’s no avoiding this one: you will have friends who feel unsettled by your decision to change. Maybe they think you’re overreacting or they miss having you as a drinking buddy. Don’t worry about this. Some people will drift away, but your real friends will stick around, or move in closer. Sobriety is a great filter for your life – it helps you get clear on who and what should be in your world. Alcohol-free living forces you to go against the grain and stop following the crowd. If you’ve spent a lifetime trying to ‘fit in’ and stay under the radar, you might find that suddenly, you’re not so bothered about that anymore. One of the top regrets of the dying is, “I wish I’d had the courage to live a life true to myself”. Now’s your chance to make sure that happens. 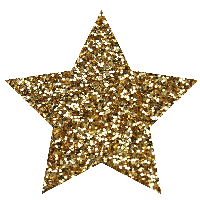 When you stop drinking – and you achieve something you thought you couldn’t do – something shifts within you. I’ve seen this time and time again with the women I coach. What’s surprised you in sobriety? No matter where you are in your alcohol-free journey, I’d love to hear what unexpected side effects you’ve noticed! 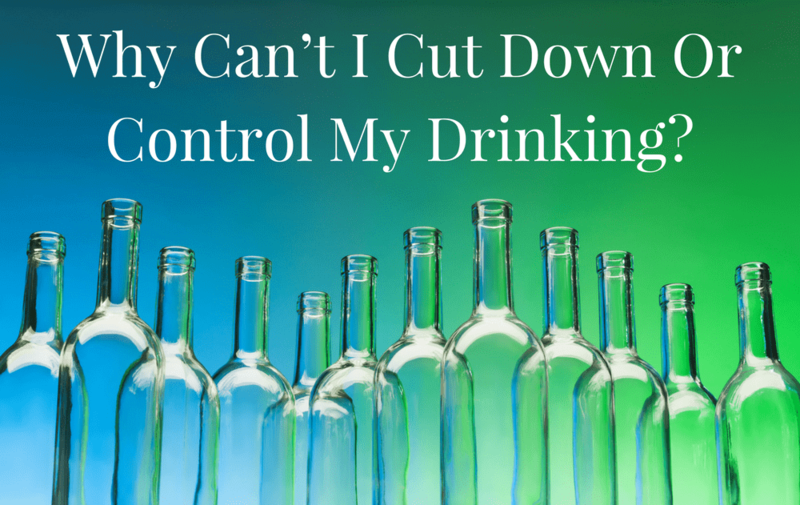 Why Can’t I Cut Down Or Control My Drinking? Why don’t I have an off switch? Why can’t I control my drinking? Why can other people have 1 or 2 drinks and then stop? Back then, my inability to control my drinking felt like such a personal failing – a weakness. Nowadays, things are different. Not only am I five years sober, but my views on all this have changed too. 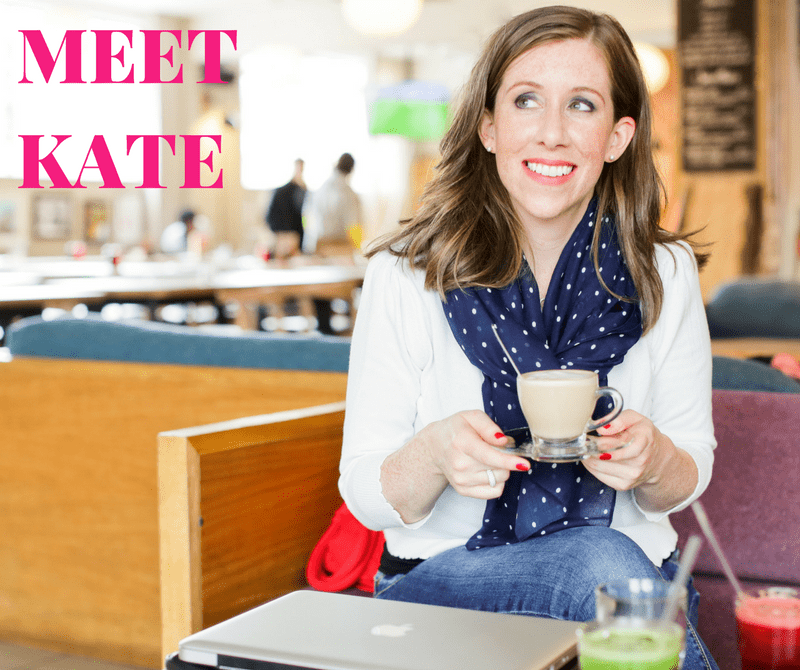 If you’ve been beating yourself up about your inability to moderate, this blog is for you. Why can’t I stop at just one drink? A better question to ask is, why should you be able to stop at one? After all, alcohol is a powerful, mind-altering, addictive drug. It zaps your willpower and changes the way you feel. It makes you lose control. When it comes to other drugs, we seem to understand this. We don’t shame smokers for becoming addicted to nicotine – we just accept the fact that it happens. We should be doing the same with booze. You are not weak or broken because you can’t ‘control’ alcohol. Becoming addicted to booze is a completely normal (and predictable) side effect of consuming an addictive substance. But some people DO seem able to control their intake! Moderate drinkers do not have superhero powers or huge reserves of willpower. Instead, their drinking is likely to be controlled by other factors. For example, some people don’t like feeling drunk or out of control. They actively avoid that sensation rather than chase it. For others, drinking just isn’t their poison – it’s not a coping mechanism for them. When they’re feeling down, they don’t turn to booze. Perhaps they have healthy coping mechanisms in place, or maybe they overeat or gamble or do something else instead. Other drinkers will be seriously restricted by finances, responsibilities or the influence of those around them. So is moderation something I should work towards? There’s no secret to moderation. There’s no magic trick that you haven’t discovered yet. If moderation was something that worked for you – on a consistent basis – and made you feel good, you would know that by now. Here’s the big problem with moderation. Cutting down, rather than cutting out, stops you from exploring sobriety properly. It reinforces the idea that you cannot truly enjoy life without booze. Moderation makes a drug like alcohol seem extra special. And because you’re trying to be ‘good’, you’re never satisfied. There’s never quite enough and all your focus is on alcohol (the thing you’re trying not to have so much of). Plus, moderating requires a lot of effort. It ain’t for wimps. You’re constantly having to make decisions. What will you drink? When? Where? How much? It’s much harder than just making one wholehearted, committed decision not to drink. 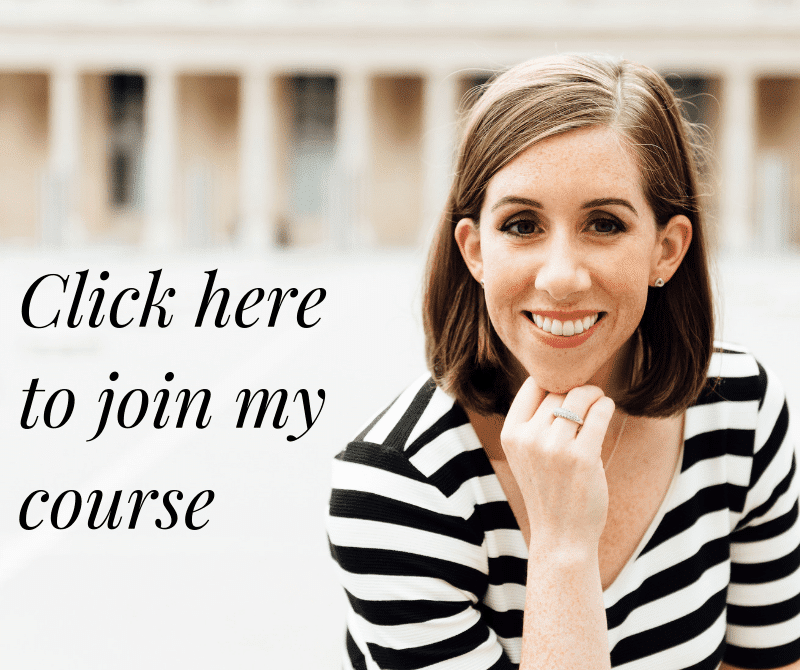 If moderation is off the table – but I don’t want to quit forever – what should I do instead? It’s normal not to be ready to quit ‘forever’ as that is a pretty overwhelming idea. But what about an experiment instead? 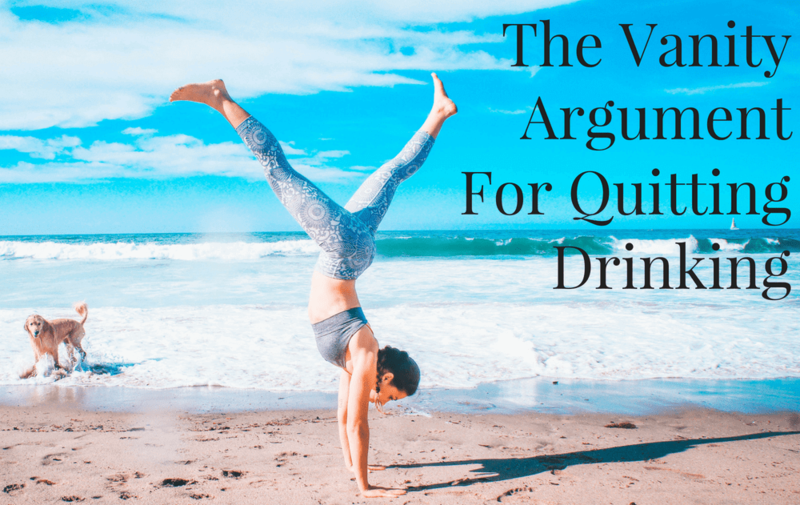 You only get to find out what sobriety is really all about when you do it and keep doing it… so why not take a break from booze? Commit to going alcohol-free for a month or two. Give sobriety 100% (no ifs, no buts) whilst feeling safe in the knowledge that at a set point in time, you will stop, review and decide what happens next. The days of me waking up and feeling sorry for myself are long gone, thankfully. I never feel as if I’m missing out by not drinking – I just feel relieved that I don’t have to drink anymore. I don’t know anyone who’s struggled with alcohol and then morphed into a happy, carefree, moderate drinker. However, I know a LOT of sober women who are living fulfilling lives after letting go of booze. They got their happiness back. And their freedom. Isn’t that what we all want? Answering that question can be tough. Towards the end of my drinking career, I found it helpful to hear about other people’s experiences and the moments that made them decide that enough was enough. 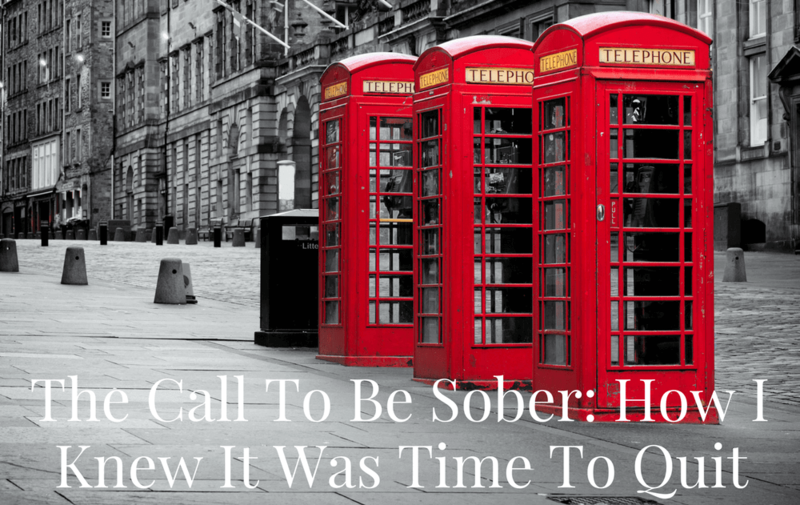 Life isn’t black and white, and sometimes the call to be sober can feel pretty subtle. Other people’s stories had more of an impact on me than filling out some online quiz, or going through a checklist of warning signs. “On Mother’s Day 2017 I invited my mum and daughter for Sunday lunch and was really looking forward to spending time with them. As usual I had lots of wine. Before I dished up the meal, my daughter asked me if I was OK and I knew she could see I was drunk. I felt really bad. I don’t remember the rest but my mum and daughter were really sad for me and I felt disappointed in myself. “For my birthday I got all alcohol related cards and presents – things like a make your own cocktail set, drinks glasses, bottle stopper, signs saying ‘in the garden drinking prosecco’. It struck me that to all my family and friends, alcohol was my thing. I felt shameful. “One day I looked – really looked – in the mirror and didn’t like what I saw. I was sick and tired of being sick and tired. It seemed the only thing I looked forward to was the end of the day, so I could hit the bottle… again. I had to get out of the vicious cycle I’d been in for so many years. Googling ‘how much is too much’ etc, is how I believe you ended up in my inbox Kate. Lol. “Too many things to mention! But the massive wake up call was going out with the girls from work, getting absolutely plastered, coming home and falling over twice. I woke up the next morning at my brothers house, because my partner had rang him to come and get me as he couldn’t cope anymore…. it was so embarrassing. “I realised that alcohol was taking much more from me than it was giving – it was beginning to affect my health, my energy levels, my job performance, and most of all, my relationships with those closest to me. One day at the middle school where I work, I saw a colorful bulletin board advertising this year’s senior slogan, ‘Today I choose to be the best version of myself’. I was ashamed to realize that I wasn’t choosing that, and hadn’t been choosing that for quite a long time. This week I’m writing to you from sunny California! A few days ago I was in LA doing lots of touristy things in Hollywood, where they’re getting ready for the Oscars. 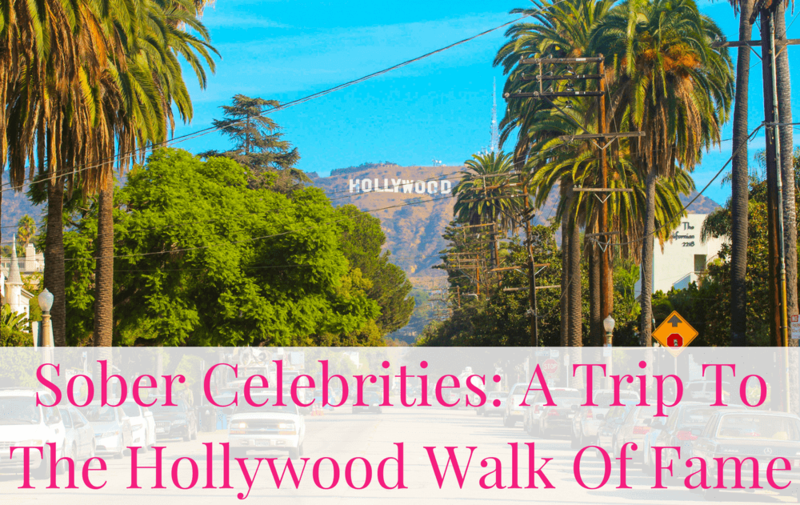 Walking around such an iconic place got me thinking about sober celebrities. In this crazy, boozy world of ours, it’s easy to assume that everyone drinks – especially in showbiz, with all that glitz and glamour. But the truth is that some of the most successful people on the planet have got to where they are because they don’t waste their time, money, health and energy on alcohol! As I mentioned in the video, not every sober celebrity has a star on the Hollywood walk of fame. Who’s your favourite sober celebrity? Let me know if I’ve missed anyone off the list! For a long time, I was very keen on the idea of moderation. I was drinking too much and feeling awful… but I didn’t want to stop completely. Sobriety was way too radical a step for someone like me, right? I was one of those people who bought nice wine. I didn’t drink every day of the week. I held down a good job. I went running and drank smoothies and practised yoga. I was definitely not some rock bottom, down-and-out drinker. But… when I did drink, things went a bit crazy. Once I started, I couldn’t stop. I definitely seemed to be missing an off switch! I was convinced I just needed to find some better strategies for cutting down. So with the help of google, I devised some creative schemes to help me manage and control my alcohol intake. Take a week off every now and then to try and ‘reset’. When it comes to dealing with a mind-altering, addictive drug that zaps your willpower and changes the way you think, it’s really hard to stick to your plans, no matter what tricks you use. The methods above would work every now and then, but never on a consistent basis. Plus, sticking to these self-imposed rules was really hard work. 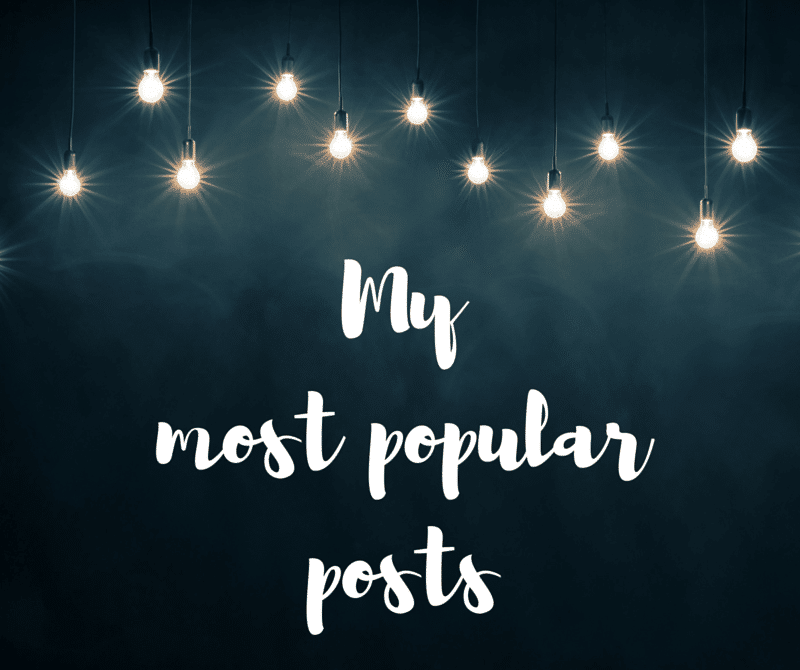 I’m nearly five years sober now and just looking back at this list makes me feel exhausted! It’s the decision-making fatigue that gets you. You’re constantly having to exercise willpower, negotiate with yourself about when you’ll drink, what you’ll have, whether you’ll stick to the rules, break them, push the boundaries, etc etc… it’s a constant drain on your energy. That not drinking at all was actually so much easier. Honestly – it’s such a breeze by comparison! The problem with cutting down (rather than cutting out) is that it reinforces the belief that you cannot properly enjoy life without alcohol. You carry on feeding that part of you that’s been duped into thinking you can’t be truly content unless you have a little bit of this liquid drug in your life. Putting a toxic, cancer-causing poison up on a pedestal like that is really not a good idea. When you’re sober, you get to see booze for what it really is i.e. a load of crap that’s holding you back. Here’s the real kicker. 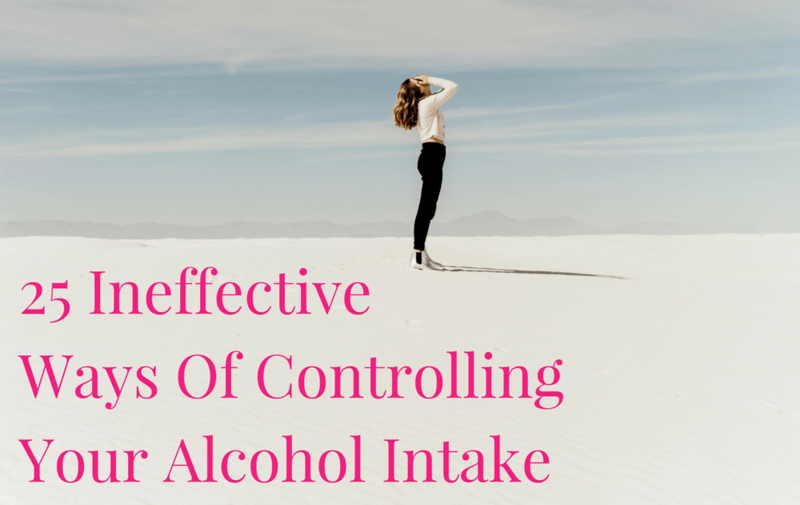 Even if you’re determined to play the moderation game – and you’re happy to put lots of willpower, effort and energy into controlling booze – tolerance WILL screw you over in the end. No matter what your alcohol intake, there will eventually come a point where you need more booze in order to feel the same effects. Be honest with yourself: how long have you been trying to cut down for? How have those attempts to control your drinking made you feel? As I discovered, there’s no real secret to moderation: it’s highly unlikely that there’s a magic trick out there you’ve missed. Too often we focus on whether our drinking is ‘bad enough’ for us to quit, when really, we should be asking, “Is this good enough for me to stay as I am?” In other words, are you willing to keep on putting up with all the downsides to drinking, because they’re not going to go away. I wrote about this here. If you’re ready to try something new, take sobriety for a test drive. Give it 100% for a set period of time e.g. six weeks. Then you can see how you feel at the end – you might just be surprised how much you love it! For more help with this, check out my stop drinking course. I also talk more about taking a break here.